White carnations and red roses set the tone around the eternal flame at the Armenian Genocide memorial. 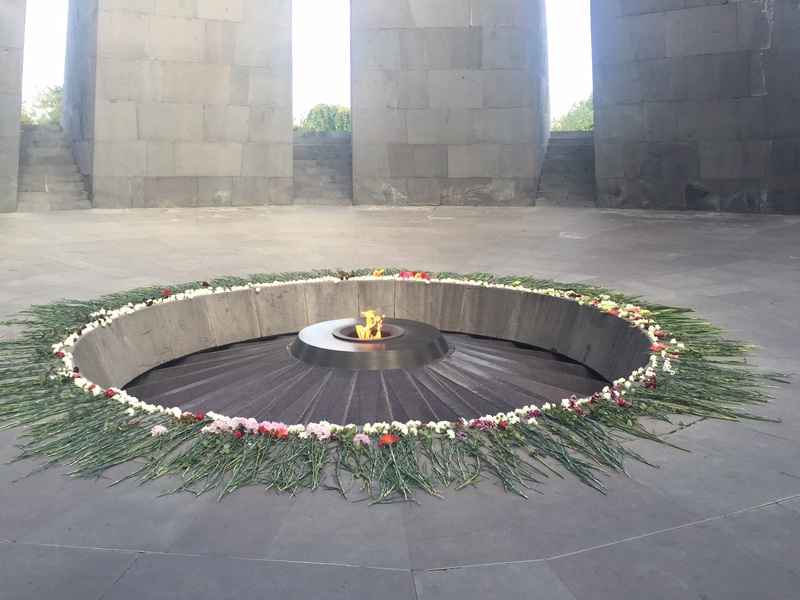 Atop a hill in Yerevan, the fire is inside a bowl surrounded by 12 great slabs of basalt representing the provinces, inside Turkey, where Armenians lived before the mass killings perpetrated a century ago. In 1900 about two million Armenians lived in Turkey’s eastern provinces. Twenty years later there were none – they either died violently or fled or were forcibly converted to Islam. This memorial centre is redolent of loss. Mount Ararat, a national symbol for Armenians, dominates the view to the south. The mountain is on Turkish soil. I have come here with participants in a conference on the Genocide. After they lay some flowers at the memorial we walk to the museum. Just outside is a small group of visitors led by a guide. He gestures towards Ararat and tells the group that only 20 km away is the traditional homeland of Western Armenia, now part of Turkey. In flawed but clearly understandable English, he tells the group: “Once it will be liberated again.” This is not the view of the Armenian government, but his words still send a shiver right through me. Emotions are raw in Armenia. Sometimes it can feel as if the killings happened only yesterday. Turkey, a NATO member, and Armenia, a Russian ally, are on glacial terms. The border between the two has been closed for decades. Russian troops, stationed on Armenian soil, guard the frontier which is dotted with watchtowers. The Armenian Genocide is a big, depressing subject. But in Yerevan, during this centennial year, it is a subject that cannot be avoided. Here is the briefest of summaries of what happened and a look at why this is a story still unfolding. The official Armenian estimate of the number of Armenians killed in what was then the Ottoman Empire is 1.5 million. Some historians put the figure lower, in the range of 600,000 to one million. By the time of the massacres the Ottoman Empire was in serious decline, having lost very extensive territories. In 1911, Italy made an unprovoked attack on the Turkish province of Libya. The two Balkan Wars (1912-1913) then deprived the empire of nearly all its remaining territory in Europe. Declining empires, it seems, sometimes go out not with a bang but a whimper. The Ottoman Empire, however, does not fit this mould. It went out with a boom that destroyed many lives. In the First World War the Turks fought alongside Germany and Austria-Hungary, so one of their enemies was the Russian Empire. After Russia suffered disastrous defeats on the Eastern Front in 1914, at Tannenberg and the Masurian Lakes, it had to pull troops away from the Caucasus front with Turkey. Russia then actively recruited volunteers, including Armenians, to bolster its depleted army in the Caucasus. The Russians proceeded to inflict a most terrible defeat on the Ottoman Third Army at the battle of Sarikamish, at the end of 1914 and start of 1915. Enver Pasha, one of the “Three Pashas” leading Turkey, blamed the Armenians for this bloodbath and the stage was set for Turkey’s revenge. But much needs to be added to this barest of outlines. Armenians suffered in a whole series of massacres in the Ottoman Empire before 1915. There were killings in 1894, 1895, 1896 and 1909. There are themes present in the violence against Armenians which have echoes in later 20th century genocides. Armenians tended to be better off than the Turks. Many were merchants or industrialists while Turks were often peasant farmers or low-paid functionaries. “The Jews of the Orient” is a label that has sometimes been pinned on Armenians. Ronald Grigor Suny, in “‘They can live in the Desert but Nowhere Else’: A History of the Armenian Genocide”, highlights competition for land as one factor behind anti-Armenian feeling. In the Rwanda Genocide, land hunger was also an issue. Back to 1915. The museum in Yerevan sets out a tragedy in three acts. The first act was the extermination of Armenian soldiers serving in the Turkish army. The second act was the murder of business, political and cultural leaders. The final sickening act was the deportations to the deserts of Syria. This has to be one of the truly terrible images of the 20th century. Straggling lines of Armenians, many of them women and children, made the nightmare journey on foot to the desert. If they weren’t shot, abducted or starved en route they died on arrival at concentration camps. One notorious camp was Meskene on the Euphrates river. Typhus, cholera and hunger claimed many lives. There was also deliberate killing. At the time of the massacres, the world did sit up and take notice. In May 1915 the governments of Britain, France and Russia issued a joint statement denouncing the “crimes of Turkey against humanity and civilisation” and calling Turkey to account. The media covered the atrocities. The New York Times, by one count, carried 145 articles in 1915 alone. Successive Turkish governments have not been apologetic about the wholesale slaughter. The official Turkish view of events is that the deaths occurred during a civil war in which both Armenians and Turks died. The Turkish government vehemently rejects the position taken by Armenia that this was genocide. Some scholars endorse the Turkish view that this was not a genocide and point to the fact that the Turks, unlike the Nazis with their persecution of Jews, made no attempt to pursue their victims beyond the borders of their state. But although there is no complete consensus, there has been a discernible shift with more scholars, spiritual leaders and governments backing the view that genocide is the correct term. In April, Pope Francis said at a Mass in the Armenian Catholic rite at St. Peter’s Basilica that humanity had lived through three massive tragedies over the past century. “The first, which is widely considered ‘the first genocide of the 20th century’, struck your own Armenian people,” he said, naming the other two as the crimes committed by Nazism and Stalinism. “Concealing or denying evil is like allowing a wound to keep bleeding without bandaging it,” said the pope. An angry Turkey promptly recalled its envoy to the Vatican. Several of the world’s most powerful governments, including the United States and Germany, have not backed the view that it was genocide. In Yerevan, I have met a number of people who have engaged with the issue of the massacres because they feel more needs to be done to redress the wrongs done. I talked to Heide Rieck, a German poet and novelist who has made it her business to publicise the Armenian cause in her native land. Back in 1915, Germany seems to have made no attempt to restrain its ally Turkey. Rieck, a grey-haired woman from Bochum in her mid-seventies, first heard about the mass killings from a Turk in eastern Turkey 30 years ago. He told her how very cruel it had all been. Undaunted by her lack of knowledge of Armenian, Rieck worked with a colleague to publish a book of Armenian verse in German translation. The book, entitled “Und sticht in meine Seele” (And it stings in my soul), contains poetry by Paruyr Sevak (1924-1971), one of Armenia’s best-loved modern poets. I asked about the themes of Sevak’s poetry. “The main theme is love,” said Rieck, adding that Sevak’s death in a car accident had been widely blamed on the KGB since he was critical of Soviet corruption. She said she was in Armenia this time partly to plant some trees as part of a garden to nurture Armenian-German friendship..
Rieck told me about a conference and we walked together to the National Academy of Sciences of Armenia, venue of an international gathering with the title “Armenian Genocide – 100, From Recognition to Reparation”. I just went in and was made welcome. It was a conference of more than 100 academics from Armenia, Russia, Europe, Australia and North America. They looked at a wide range of topics, including the impact of the Genocide on the arts, but the meatiest, most newsy issue was reparations from Turkey. A lecturer in general education from the American University of Armenia, David Davidian, told the conference that he estimated the material losses of Armenians in the Genocide at three trillion U.S. dollars. This did not take into account any compensation for loss of life or injury. One participant, Armen Marukyan, gave me a copy of his book “The Basis and Opportunities of Applying to International Court on the Case of the Armenian Genocide”. It goes into legalities in some detail. Marukyan writes that before the Genocide, Armenians in eastern Turkey had 1,860 churches and chapels, 451 monasteries and about 2,000 schools. The conference had the usual formality of academia, but it also felt quite cosy. The community of genocide specialists is fairly small. At the end a portly Russian professor with a red bow tie and matching handkerchief in his jacket pocket, Vladimir Sakharov, grandly handed out medals. Have we suddenly been taken in a time machine back to the Soviet era, I wondered. The conference decided not to make any formal announcement to the media about its proceedings. I think conversation among academics about reparations from Turkey will rumble on for a while before they take any advice to the government, which has not so far brought a legal case against Turkey. From 1920 to 1991 Armenia was part of the Soviet Union and was not in a position to bring a law suit. 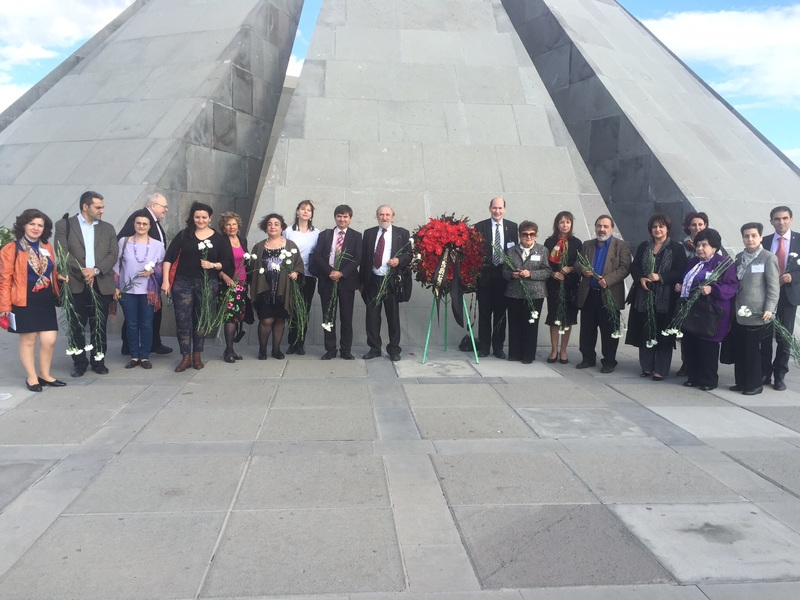 At conference close we all climbed into a bus and headed off to the Armenian Genocide memorial to lay the flowers. 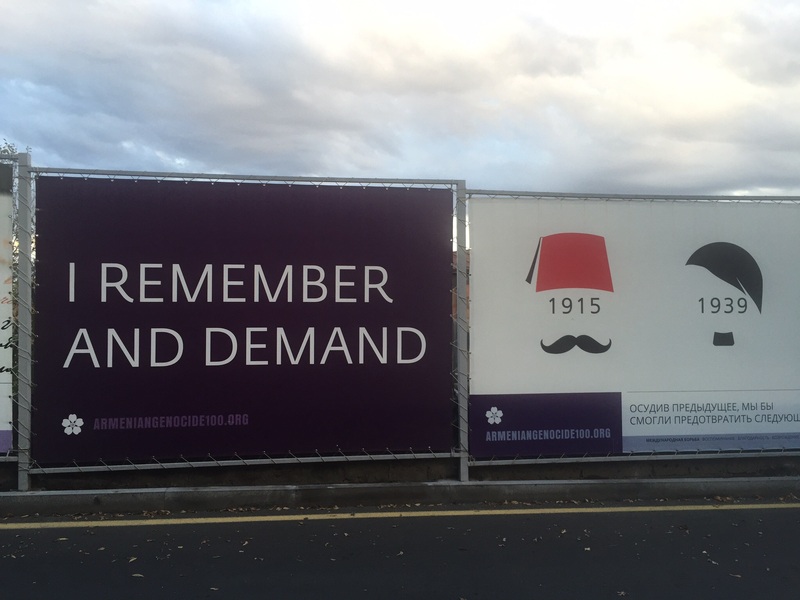 Just below the centre is one of many billboards in the city commemorating the centenary. Its message reads “I remember and demand”. No one who has studied the chilling events of 1915 in Anatolia can doubt the scale of the atrocities. But what exactly does Armenia demand one century later? Only Armenia, of course, can decide.